* Intimacy with God is the ultimate purpose of your design. Of all things God made, you are his prized creation. The Refreshed Heart will show you what is so amazing about the way God made you...and your capacity to know what is so amazing about God. 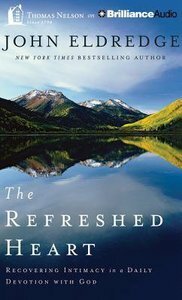 About "Refreshed Heart (Unabridged, 2 Cds)"
John Eldredge is an author, a counsellor, and teacher. He is also president of Ransomed Heart, a ministry devoted to helping people discover the heart of God, recover their own heart in his love, and learn to live in his Kingdom. He is also the author of numerous books, including Epic, Waking the Dead, Wild at Heart, and Desire, and co-author of Captivating and The Sacred Romance. John grew up in the suburbs of Los Angeles (which he hated), and spent his boyhood summers on his grandfather's cattle ranch in eastern Oregon (which he loved). John met his wife Stasi in high school (in drama class). But their romance did not begin until they each came to faith in Christ, after high school. John earned his undergraduate degree in Theatre, and directed a theatre company in Los Angeles for several years before moving to Colorado with Focus on the Family, where he taught at the Focus on the Family Institute. John earned his master's degree in Counselling from Colorado Christian University, under the direction of Larry Crabb and Dan Allender. He worked as a counselor in private practice before launching Ransomed Heart in 2000. John and Stasi live in Colorado Springs with their three sons. While all of this is factually true, it somehow misses describing an actual person. He loves the outdoors passionately, especially living in the Rocky Mountains, and all beauty, Shakespeare, bow hunting, a good cigar, anything having to do with adventure, poetry, March Madness, working in the shop, fly fishing, classic rock, the Tetons, fish tacos, George MacDonald, green tea, buffalo steaks, dark chocolate, wild and open places, horses running, and too much more to name. He also uses the expression "far out" way too much.